Our custom printed Fry Scoop Cups are more than meets the eye! This unique food service item is one of a kind in the USA. Available in single or double coated paper for both hot and cold food applications, there will be no more worrying about grease spots on your fry bags or the hassle of trying to load small fry bags during food prep. These French fry cups, also known as French fry containers or fry holder, serve as the perfect French fry scoop because of their wide rim. They’re the perfect fry cup! This French fry scoop can fit into any type of stainless steel French fry cup holder, and they’re the perfect size to fit any type of French fry holder rack. If your business is looking for a dependable grease free fry container, than you, your business, and customers won’t be disappointed getting served fried food in this professional looking custom printed French fry container. These new, one of a kind Fry Scoop Cups will help streamline your food service prep time and give you a unique, branded food service item to add to your food service presentation. Our line of custom printed Fry Scoop Cups have a high-gloss or matte outside finish. They are printed in Hi-Definition, full-color to give you the best impression available on a disposable paper cup. Fry Scoop Cups are great for french fries, chicken nuggets, fish bites, chips and more! Enhancing your branded message to your customers has never been so easy! Perfect fry cup for any size restaurant! 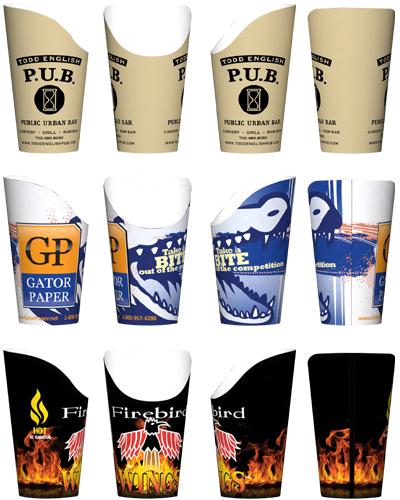 Custom printed Fry Scoop Cups are a great way to extend your brand far beyond conventional fry bags! What is the minimum order requirement for Fry Scoop Cups? Custom printed Fry Scoop Cups have a 2,500 piece minimum order requirement. Our small order requirements and short production times make these cups a perfect fit for any size restaurant. How long will my Custom Printed Fry Scoop Cup order take for production? Current lead time for a custom printed Fry Scoop Cup order is 2-3 weeks. Rush orders are available for an additional fee where the production schedule allows. Full color and full coverage printing is available. If you can dream it, we will make it a reality! What kind of art files are required for proofing? Adobe Illustrator, .EPS and high resolution PDF files work the best, and Vector art files are preferred. If the line artwork is simple enough, sometimes a JPEG file will work, however, bitmap files are too low quality and are never accepted. Need a price quote on custom printed Fry Scoop Cups? Contact us today! If you are looking for more unique food service items, then look no further than our custom printed Heat Seal Paper. 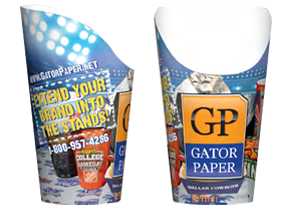 This new revolutionary paper is offered exclusively by Gator Paper and is sure to make you rethink food service packaging!